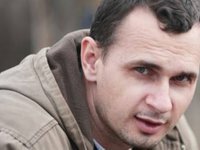 Ukrainian film director Oleh Sentsov on Thursday was awarded the Andrei Sakharov prize "For Freedom of Thought" by the European Parliament, the Associated Press agency has reported. According to it, the prize in 2018 was awarded to Ukrainian film director Oleh Sentsov who is serving a prison sentence in Russia. The short-list of nominees, except for Sentsov, also included a group of non-governmental organizations involved in the rescue of migrants at sea and the protection of the rights of refugees, and Moroccan activist Nasser Zefzafi, who led the protest movement on social and economic problems in Rif region in Morocco, and was sentenced to a long prison term.